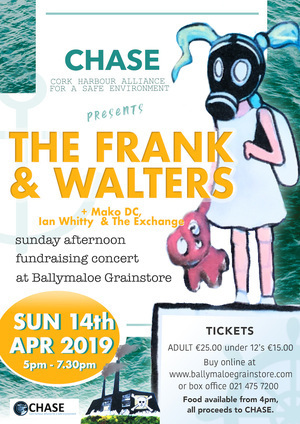 Taking place at Ballymaloe Grainstore, County Cork on Sunday April 14, Irish indie legends, The Frank & Walters will be joined by MAKO DC and Ian Whitty & The Exchange for a special event to raise funds for Cork Harbour Alliance for Safe Environment (CHASE), a community group that has worked tirelessly and voluntarily since 2001 to oppose the construction of a 240,000 tonne waste incinerator in Ringaskiddy, which would see a radius of contamination of approximately 40 miles. Posted in Misc and tagged Frank And Walters at 11:47 am on March 22, 2019 by Bodger. Presumably someone is confusing this with Chernobyl. Or is this just another word for Cork?